I have made this card for my young daughter and I have used an embossing folder to make the body of the card. I also use a Spellbinder to frame my card. I used another Spellbinder and I made a silver label finishing with powder and a hot gun. I put my greetings on it. I made a little pin with pears and add a little charm. It' a guitar, because she is a musician. A swirly pearl from want to scrap and on top a butterfly with diamonds. I finally add some flowers from Wild flowers company. You surely recognize some trick I have learned from Christina. 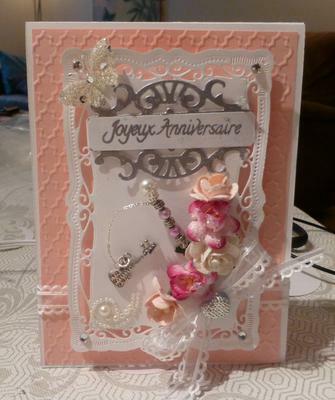 This card is a hinged card and I also add a white ribbon and a bow. Finally I have glittered the flowers and added 4 diamonds on corners. My daughter was very happy to receive this card and I hope you like it too. The card is beautiful and I am sure that your daughter was delighted with it .. and to know that her mum had made it especially for her. I love the color scheme and all the glittery embellishments make it super special. Your creativity used for this card is amazing. What a beautiful card for anyone to receive for almost any occasion. Love the color scheme. What a lovely card you have created. What a beautiful and elegant card!! You've created something awesome that I'm sure your daughter will treasure forever! Thank you for sharing it with us. Lovely card, really like the colours. What a lovely card. No wonder your daughter was thrilled with it. How lovely and such a nice colour scheme, I'm sure she will be very pleased with it.